Why do I need to see an eye care provider? Many “silent” diseases, such as glaucoma and diabetes, can only be detected through regular eye exams. When these conditions are discovered earlier rather than later, they become easier to treat or manage, allowing for better long-term preservation of eyesight. In addition, reading glasses from the drugstore often do not work well because most people have astigmatism and/or different prescriptions in each eye. As a result, many of these individuals experience persistent eye fatigue and headaches. Forgoing the eye exam also sacrifices the opportunity to screen for treatable diseases, as mentioned above. How often do I need to get new eye glasses? This depends on a number of personal factors, such as changing needs, tastes or lifestyle, but you should visit your eye doctor at least once each year. If you notice problems with vision or headaches, then it’s best to consult your doctor right away for a full evaluation and new glasses, if needed. How can I tell if I need bifocals? Bifocals and progressive lenses are most often prescribed for presbyopia in those over age 40 and for individuals who have trouble seeing clearly both at a distance and when reading. Bifocals can also help a person who over-crosses his or her eyes when viewing close objects. An eye exam with a qualified eye doctor can assist you with determining whether bifocals are right for you. 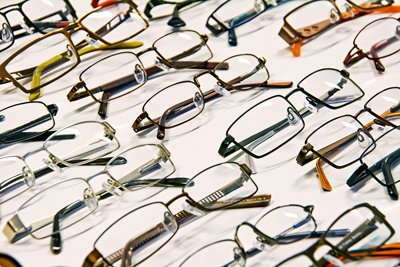 Instead of bifocals, can I use progressive lenses and choose a smaller eye glass frame? Yes. Progressive lenses offer more precision in your viewing range within a smaller lens diameter. However, some frames are too small for a proper fit; a trained optician can work with you to find a frame that is sized correctly for both your lens and your face shape. Why are the lenses so thick? The final lens thickness depends on the strength of your prescription, the size of your frame, and your personal measurements. Fortunately, recent innovations in lens designs and materials have made lenses thinner by up to 60% in some cases. If lens thickness is a concern for you, notify the optometry staff member; he or she will help you select a frame and lens that allow you to use a thinner lens. Will I have to wear eye glasses forever? Unfortunately, you probably will unless you elect to use contact lenses or corrective laser eye surgery. The great news is that there are lens and surgical advancements in optometry everyday.